Don’t know what to wear this Sunday? Our stylists may help you on that. 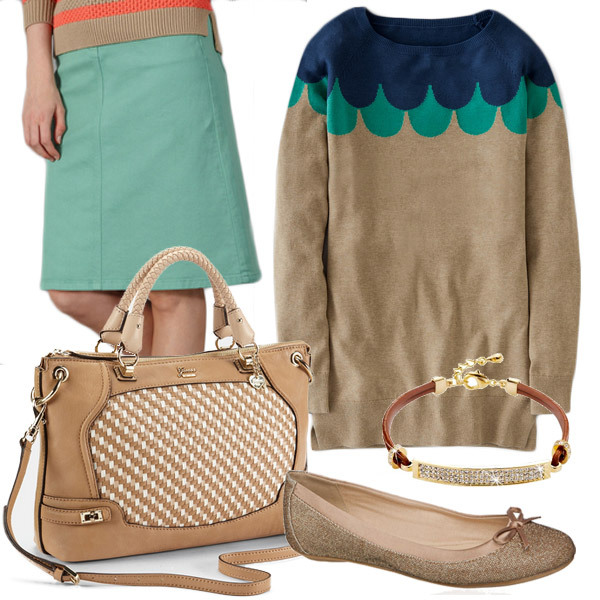 Here’s a casual outfit based on an emerald everyday A-Line Skirt from Boden. A-line skirts are a great option for balancing your bust with your hips. They can do wonders for Pear, Diamond, Inverted Triangle and Straight body shapes. For Pear and Diamond body types, the A-line skirt balances the widest part of your hip without adding more volume. For Inverted Triangle and Straight body shapes, it can add just a bit of volume to create a waist. One of London’s most important fashion events has come to an end. For five days, over 200 designers showcased their brand new Autumn/Winter Collections at London Fashion Week showing their vision to the world. Like every other fashion lover, we watched this event closely (read this preview of the event) and we gathered some highlights of this show. Below, we’ll mention the most common trends from different designers and some of what we think that will be trending on the next Autumn/Winter 2013. Please note that this post is a personal perspective of the event, written by Irina Quintela. Irina is the founder of Styling Up, a style shop that provides an online fashion styling service for women based on body shape and size. Autumn/Winter 2013 will be all about prints and graphic lines. Floral prints are becoming a thing of the past, and prints are now more African inspired. Some of the prints that walked the runway were actually pretty wild (in a good way). We love them! Graphic lines will also be trending and, according to what we saw on the catwalk, geometry is all around several collections. Whether straight or curved lines… this is a trend we really want to wear. For fans of geometry, this is the trend to follow! We saw lots of collections inspired by the monochrome mix. We love the combination between black and white. It provides a great contrast and this can be a really easy combination to pull off. Red, Gold or Yellow, Blue and Green will surely pop out of the catwalk straight to the streets. We saw some awesome combinations and splash of colors. 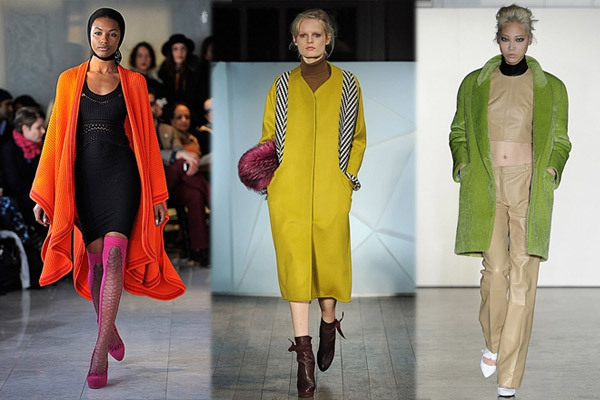 Autumn Winter 2013 will surely be a more colorful season with these vibrant colors. These also look great in accessories, when just wearing a monochrome look. Skirts and dresses have gained a new stylish length. 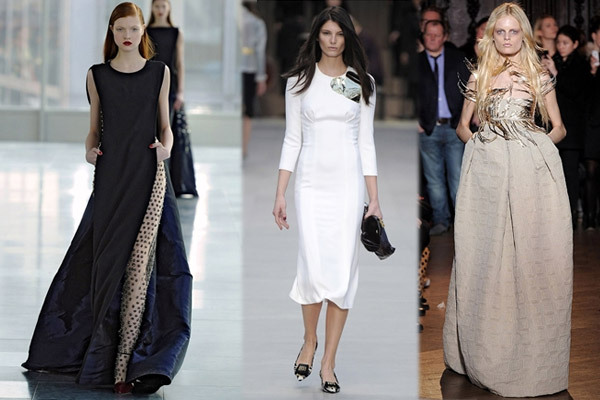 We already knew mini, midi and long skirts… but now, here are the fashionable new super long skirts and dresses. Super long because they’re way longer than the traditional long skirts and they can practically “kiss” the floor. We’re totally embracing this and can’t wait to see this on the streets. We also noticed that skirts are moving away from mini and embracing the midi and slightly below the knee length. This might be really great news for the ones who were tired of the super miniskirts. What about you? Have you followed London Fashion Week’s AW 2012? What trends will you surely wear and which ones will you run away from? 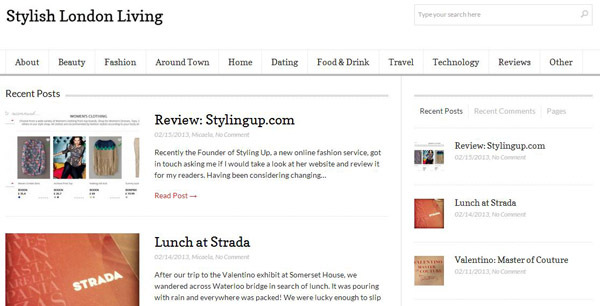 First of all we’d like to thank Micaela, from the Stylish London Living blog for such a wonderful review of our website. Overall it was a great review giving our website a great 4 out of 5 stars. Reviews are a great way to let us know how to improve our service and we’re always very happy when we receive feedback. Stylish London Living is a great blog that has awesome content about beauty, fashion and lifestyle, and is written by London based lady Micaela. Do take a look at her wonderful blog. London Fashion Week starts tomorrow. Here's a preview of what to expect, written by Fi, from the blog "We Heart Colourful". London fashion week (LFW) is one of the highest-profile fashion events in the world, being among the ‘big four’ international catwalk influencers (the others being New York, Paris and Milan). You can read part one of our London Fashion week preview over at weheartcolourful.com. So what can we expect from the London leg of this season's fashion circus? More and more high-street brands have to staging catwalk shows in recent years - this year's London fashion week will see River Island make its debut with its Rihanna collaboration, while upmarket high-street chain Whistles will host a salon show. Meanwhile H&M, which has previously hosted fashion events with the likes of Versace, is preparing to make its Paris fashion week debut with a show at the Musée Rodin in a couple of weeks' time. Here in the UK, Topshop's label, Unique, has shown at London fashion week for more than ten years, while American label J Crew has enjoyed huge success at New York fashion week, taking part the shows there for the fourth time next Tuesday. The fusion of masculine and feminine aesthetics will be a strong theme at this season's London fashion week. The strength and effectiveness of this fashion phenomenon will lie wholly in the subtleties. Slight references to the opposite gender in outfit cuts, hair - and the occasional bit of understated makeup. However, Very much at play for AW13 will be is shoulder-length hair. Mid-length, grungey-but-neat hair, perches neatly between androgyny and masculinity - it's simply up to the viewer to choose which way the look sways. Martin Van der Horst’s anti-consumerist influences are the perfect complement of the androgynous. Have you got any LFW must-sees or forecasts? Leave a comment! Fi is one half of fashion, beauty and lifestyle blog, We Heart Colourful. She loves colour clashing, fashion innovation and vintage styling, and is a big jewellery fanatic. Fi really enjoys collaborating with other bloggers and brands she loves, or just hearing what her readers have to say. Here's our today's outfit, recommended by our fashion stylist Elena Finn. We love this because it’s a great outfit for casual, evening, weekend or party. For party events if you don’t want to use flats, just replace them with some platform or pump shoes and you’re ready to go! Boden, Allsole and My Bag have joined the Styling Up family and now you can also find recommendations from our stylists for your body shape and size for the brands available at these top retailers. Boden is a British retailer that has a collection with awesome quality for price. They offer a wide variety of tops, dresses, pants and also a large collection of knitwear. Their designs are great for formal-work, evening or weekend occasions and their fabric quality is also great. All Sole is specialized in footwear. It has several high street and high end brands and a wide variety of all kinds of footwear. You can find all the latest heels, flats, ballerinas, boots, etc, from top brands like Ash, Barbour, Hunter, Melissa, Ted Baker, Ugg, Vans, Vivienne Westwood for Melissa and many others. My Bag is a retailer that has the latest bags, handbags, from several top high street and high end brands. Their labels include The Cambridge Satchel, Ted Baker, Herschel, Barbour, Ted Baker and many, many more. We’ve also updated our fashion brands list page. We are constantly working to find the best brands for you. So, tell us, what brands would you like to see in our website? February 14th is arriving and like all special occasions it’s perfect to wear a stunning outfit. Whether you’re going out or staying at home, having dinner or lunch, this is a great opportunity to show off a stylish outfit. To help you in that task, our fashion stylists put together 10 outfit ideas for Valentine’s Day, that are available at our style shop. Some are hot dresses, others include pants or even jumpsuits. Just remember that the secret to look stunning is to feel stunning. An extra tip we’d like to give you is that you should ALWAYS shop for your body shape. Already know what you'll be wearing for Valentine's Day? Leave a comment... we'd love to know.